Cut white card stock to make four equal squares. 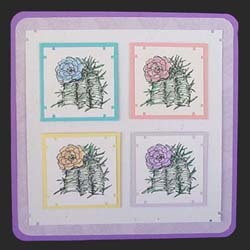 Stamp Cactus on each square using black Memories ink. Color with pencils. Punch all sides with Southwest Corner Punch. Layer on coordinating card stock, as shown. We used Corner Rounder on last two layers. Note: May use any permanent black ink as a substitute for Memories Ink.